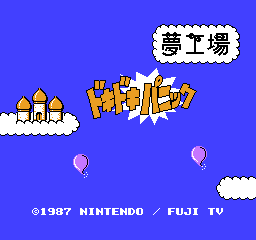 The Doki Doki Panic title screen has three balloons that pop and show the title logo. 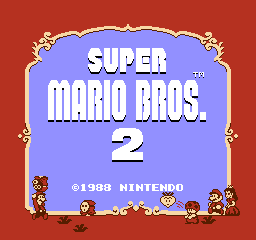 The Super Mario Bros. 2 title screen is devoid of animation. Doki Doki Panic's animated intro sequence starts out with two kids (Piki and Poki) reading a book, when suddenly, Wart's hand pops out and pulls them into the book. After their pet monkey (Rusa) runs off to find help, the four main characters appear out of nowhere and jump into the book, one at a time. 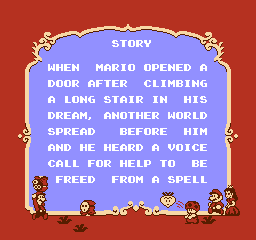 In Super Mario Bros. 2, the intro is only two screens of text about how Mario stumbled upon a world that he previously saw in a dream. 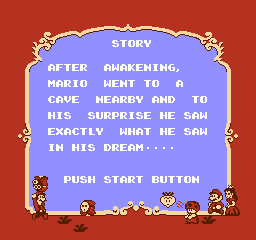 Thus, Doki Doki Panic takes place in a book, whereas Super Mario Bros. 2 takes place in a bizarre dream world. In Doki Doki Panic, each character has their own file, and you can save your progress to the game disk. When you beat a boss, you clear the "Chapter" and return to the character select screen. If you switch to another character, you can start at Chapter 1-1 or at any Chapter that you've already cleared with that character. 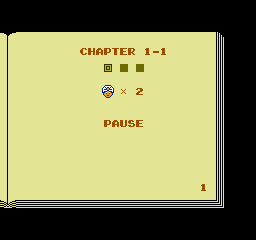 Super Mario Bros. 2 has no save feature, but you can pick your character before every level. After selecting a character in DDP, the screen slides to the right to show the other open page of the book. 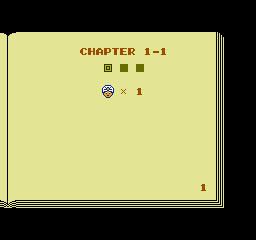 This screen shows your character's head icon, his or her remaining lives, and the page number at the bottom, which increases with each level. For example, Chapter 7-2 is page 20. 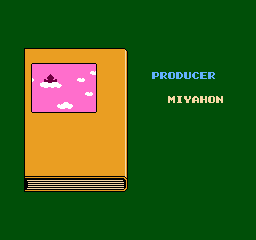 As you can see in the comparison below, SMB2's level intro screen's background design came from chopping off the left side of the book and mirroring the right side. The scene shown in DDP's level intro screen is reused for every Chapter. 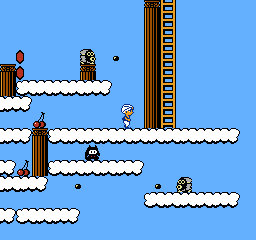 For SMB2, the developers added three more scenes to match the various settings in the game. There's a desert scene for Worlds 2 and 6, a snow scene for World 4, and a cloud scene for World 7. SMB2 uses a modified version of DDP's scene for Worlds 1, 3, and 5. When restarting a level after losing a life, DDP shows the level intro screen without the scenery. Like its level intro screen, DDP's pause screen also includes your character's head icon. DDP's Bonus Chance screen is incredibly bland. SMB2 merely used its own title screen as the background, but anything is an improvement over DDP's design. The cool thing about DDP's bonus chance is that the vegetables change depending on what level you're in. This would've been neat to see in SMB2, but, oh well. These are all the items and characters that were redesigned for SMB2. The enemies were not changed, except for the boss of 5-3. 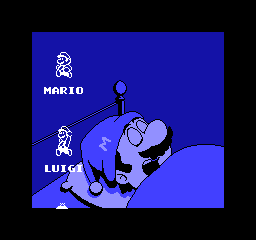 The average-skilled brother, Imajin, was changed to Mario. The high-jumping Mama was changed to Luigi. This is the first time that Luigi is depicted taller than Mario in a game. The long-jumping sister, Lina, was changed to Princess Toadstool. The strong Papa was changed to Toad. The red grass tufts were black in DDP. 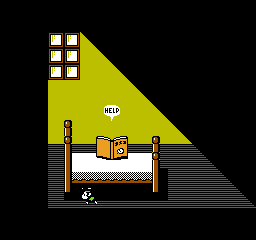 This explains why the vegetables you pull up in SMB2 have black grass on them. The Magic Lamps that make doors appear were changed to Magic Potions. 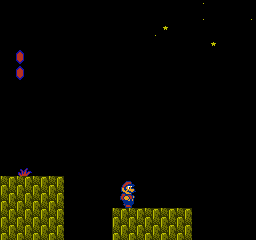 The power-ups that are hidden in Sub-Space were changed from Hearts to Mushrooms. 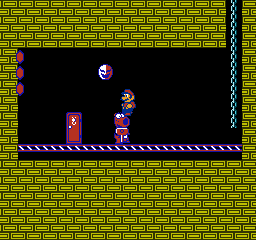 In DDP, the 1-Up item was your current character's head. The blackface head named "Big Face" was changed to a turtle shell. 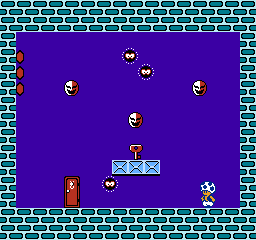 The mask gate was changed to a hawk design for SMB2. The "BOM" explosion was changed to the English "BOMB." Phanto looked less menacing in DDP. 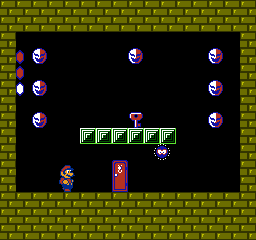 Mushroom Blocks were originally odd-looking Masks. 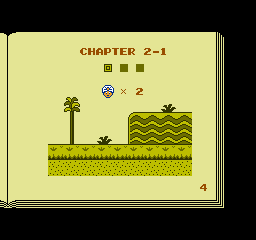 For SMB2, the first mask design was split into plain and spotted blocks, the latter being used in World 5 only. This veggie, which only appears in World 7, was also changed. 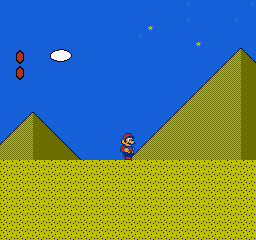 Mario's small-to-Super (and vice-versa) size changes from Super Mario Bros. were brought back for Super Mario Bros. 2. 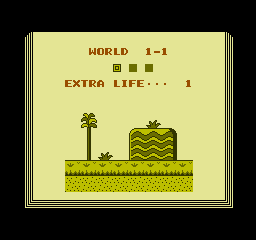 In SMB2, your character shrinks when his or her life meter drops from two dots to one dot, and grows back to normal when the life meter increases from one dot to two. The characters in Doki Doki Panic do not change sizes at all. The player characters in DDP only have one walking speed. 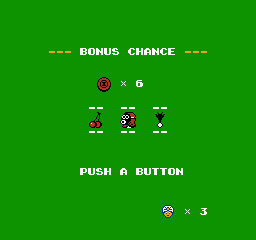 The "B-Button run" ability was duly added to SMB2. After losing all your lives in DDP, you can either continue or save. Choosing to continue will take you back to the character select screen. 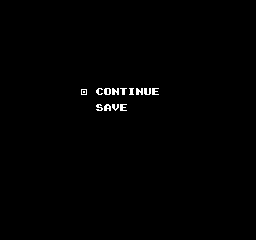 Choosing to save will save your progress and take you back to the title screen. 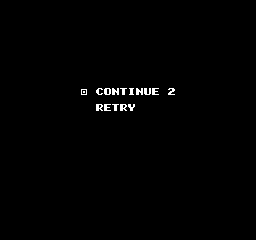 Since you can't save in SMB2, your options are a bit different: Continue or retry. 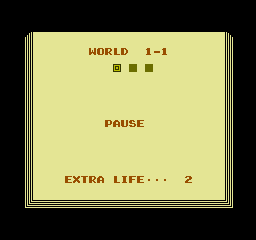 SMB2 gives you two continues, and if you use one, you'll start back at the first level of the current world. For example, if you lost all your lives in World 3-3, you'll continue in 3-1. Choosing to retry is like pressing Reset; you'll end up back at the title screen. In DDP, Phanto doesn't move when you grab a Key; he waits until you leave the Key room to start flying at you. 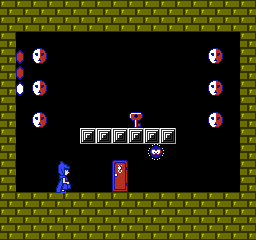 When you take a Key in SMB2, Phanto will flash, shake, then attack inside the Key room. 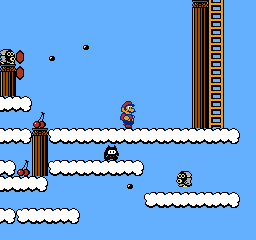 Increasing the challenge even further, four Phantos were added to SMB2. The Key rooms in Worlds 6-1 and 7-2 did not originally have Phantos, so one was added to each room. 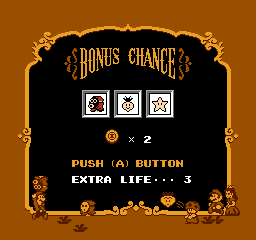 In Worlds 2-3 and 3-3, a Phanto was added directly above each Key. All of the added Phantos are the ones that come alive when you pick up the Key. 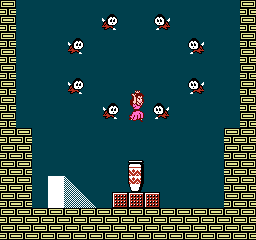 Doki Doki Panic originally had three Mousers, the third one appearing at the end of World 5-3. The white Mouser was replaced by Clawgrip, a rock-throwing crab. 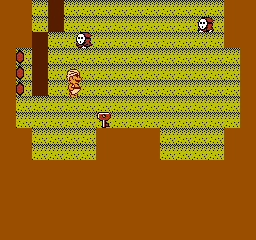 Above is a map of the third Mouser's chamber, which was completely replaced by Clawgrip and his stockpile of rocks (below). The four clumps of grass to the left of Mouser were bombs. Replacing the third Mouser with Clawgrip in World 5 wasn't the only change to the bosses. 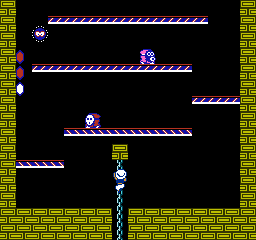 In SMB2, the second Mouser is weaker (he takes five hits instead of six) and Wart is stronger (he takes six hits instead of four). 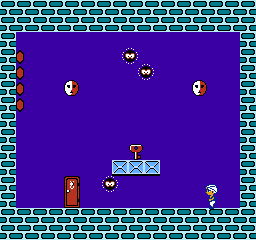 As for the bosses of World 5, Mouser in DDP takes six hits, whereas Clawgrip in SMB2 takes five hits. We've listed all the bosses and their hit points (HP) in the table below. One HP equals one hit with a bomb, Mushroom Block, vegetable, etc. Bosses are listed in order of appearance. Worlds 2-1 and 6-2 have a repeating star pattern in the sky. In SMB2, the pattern's starting point was shifted to the right by 96 pixels (6 blocks). A power-up was added near the beginning of World 4-1. Two tiles of sand were removed under the warp vase platform in World 5-3. 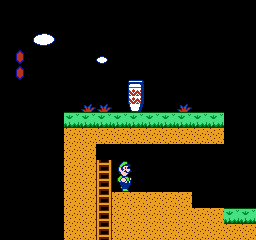 As a result of this change, Luigi is the only character in SMB2 who can power jump to the platform. In DDP, all four characters can start on the sand and curve a power jump around the ledge to reach the top. World 6-3's secret shortcut takes you to a cloud platform near the pyramid entrance. 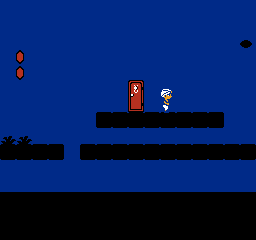 Taking the shortcut is a bit riskier in SMB2, where the door was moved further away and three small cloud platforms were added in between. See below for a mini-map comparison. At the end of the second area of World 7-1, the highest cloud platform was removed, and the gray Snifit was moved to the nearest column on the left. Also, the tall column-and-ladder combo was moved to the right. We're guessing these changes were made because every character in DDP can jump from the Snifit and go over the tall column to avoid going through the cloud-maze section in the middle. After the changes, only Luigi and Princess can make the jump. 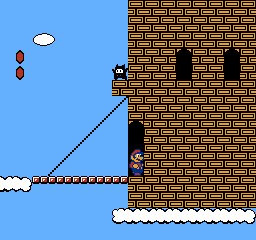 Wart's castle entrance is a bit different in SMB2. The windows are slightly taller, while the door is shorter with a fully rounded top. The conveyor belts were redesigned and look a bit darker. Wart's room has redesigned red blocks in SMB2. To see the full ending in DDP, you must defeat Wart with all four characters. 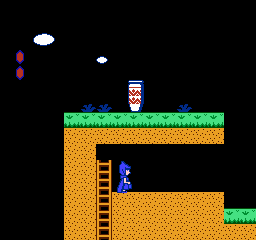 Until then, the ending only shows your character releasing the Sub-Cons from the vase. 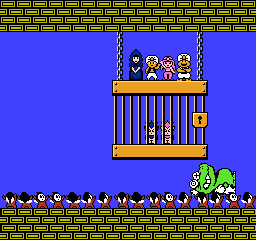 DDP's full ending starts with Wart being carried off, then Piki and Poki are freed from a cage. 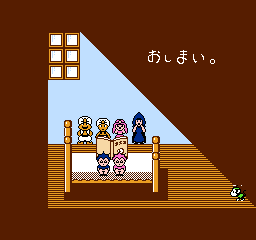 After the staff credits roll, Piki, Poki, and the four heroes jump out of the book and back into the kids' room. 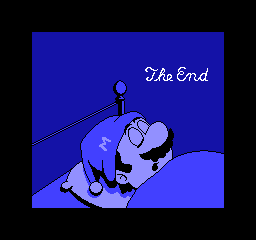 In SMB2, the ending is the same every time: Your character releases the Sub-Cons, Wart is carried off, then the cast of characters scrolls by while Mario snores away in bed. After releasing the Sub-Cons, DDP thanks your character and tells you to set Side A of the disk, which will take you back to the title screen. The four heroes of DDP stand and wave on top of the cage. 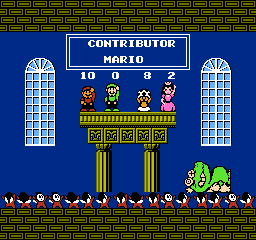 SMB2 shows how many levels each character cleared and names the top contributor. 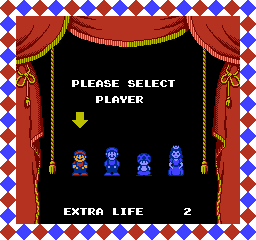 DDP's staff credits were replaced with SMB2's cast of characters. The following names come from the DDP and SMB2 manuals. Neither game has a pink Beezo. This error comes from the DDP manual's gray Beezo entry, which includes a screenshot of a pink Beezo that doesn't appear in the actual game. 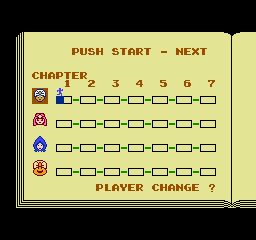 For the SMB2 manual, NOA kept the old screenshot and renamed the enemy "Beezo - Pink." Flurry, Spark, and Tweeter are shown in the SMB2 manual, but not in the DDP manual. Albatoss's Japanese name "Tondoru" comes from kondoru (condor). Ostro's Japanese name "Daucho" is a rearrangement of dachou (ostrich). 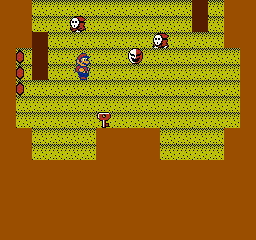 Now known as "Shy Guy," this enemy was also called "Shy-Guy" in Super Mario World 2: Yoshi's Island and Tetris Attack. His Japanese name "Heihō" is likely derived from hohei (foot soldier). 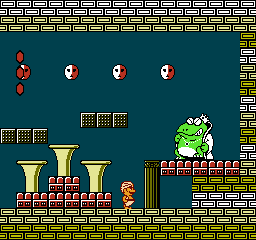 Wart's Japanese name "Mamū" comes from muma, which is Japanese for "nightmare." Since Clawgrip was a new boss for SMB2, he did not get a Japanese name until Super Mario USA. In Doki Doki Panic, not many items were animated. 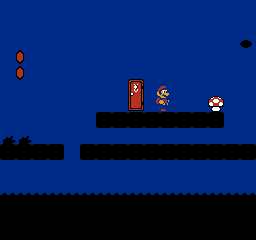 For example, there are no animation frames for Cherries, POW Blocks, vines, grass, Crystal Balls, Bomb fuses, water, cloud platforms, and spikes; these were all animated for SMB2. The Albatoss enemy in DDP has fewer animation frames than its SMB2 counterpart. Waterfalls flow very quickly in DDP and were slowed down for SMB2.